The World Health Summit is taking place from 14-16 October. Even with regard to the main international health organisations there is a large number, he said, from WHO to UNAIDS, the World Bank, the Global Fund for AIDS, Tuberculosis and Malaria, Gavi the Vaccine Alliance, and many other relevant organisations. “If you want to ensure the full implementation of the health-related SDG, leaving no one behind, we need a clear and coherent plan. We need to know who is in the lead in order to avoid duplication and chaos and ensure efficiency.” The only legitimate organisation to take up the lead function is the WHO, Spahn underlined, acknowledging the need for more stable funding for the UN health agency. A day earlier, the German Minister of Health told a Berlin newspaper it has to be avoided that the WHO has to “walk around with the bell bag” time and again. Matshidiso Moeti, regional director of the WHO Regional Office for Africa, during the WHS opening ceremony reported that global security in the light of regional Ebola outbreaks still needs much work, but a lot of progress has been achieved, for example with having data about health systems and outbreak information from African countries. For the Germany-initiated Global Health Hub, the minister invited stakeholders to come back to Berlin for its opening on 3 December. The Norway/Ghana/Germany-prepared SDG action plan will be discussed at the World Health Summit tomorrow with WHO Director General Tedros Adhaom Ghebreyesus and health ministers of Uganda, Ecuador and Germany. An even more existing “gift” for some in the medical research community is the organisation of this year’s WHS with the 2018 meeting of the “Grand Challenges in Global Health” alongside the summit. The Grand Challenges meeting will be opened jointly by Bill Gates and the German Chancellor Angela Merkel. “This is big, certainly for Germany, and also a testimony that we are in a very different place today than ten years ago,” Stefan Kaufmann, director of the Department for Immunology at the Max Planck Institute for Infection Biology and a Grand Challenge project coordinator for “biomarkers of protective immunity and surrogate markers of TB disease in Africa.” Kaufmann was one of the researchers who rang the alarm bell on antimicrobial resistance over a decade ago and developed a new vaccine for TB. Both antimicrobial resistance and new vaccines against TB, malaria and Ebola receive special attention at the WHS. Detlef Ganten, founding president of the WHS and M8 alliance, which has grown from a small gathering of the leading medical institutes from G8 countries to 21 big health centres around the world and over 130 academies of medicines internationally, also applauded the increased political attention for global health. Given that health is the natural entry point to all 17 SDGs, the status quo of global health nevertheless remains highly worrisome, Ganten said. Factors like climate change, political instability, war and conflict, migration and economic crisis are contributing to major health problems. The concern is also expressed in the M8 alliances Berlin 2018 declaration. The declaration also for the first time talks about a new initiative on “respect and dialogue” in order to foster an atmosphere of mutual respect and contribute to an open, free, peaceful, forward-looking culture of discussion” in science. “Basic research, clinical research and public health-oriented research are fragmented in a way which is not up to the challenges to what needs to be done to improve health around the globe,” Ganten told Intellectual Property Watch, and while the WHS is not a funding conference, it intends to help with agenda setting. Apart from additional financial efforts, there is a need for “getting the traditional type of medical research more to this global thinking and global scope,” Ganten said. Lynda Stuart, deputy director of the Gates Foundation, in a panel on vaccine production and delivery systems explained that the foundation in all grants takes a strong position to include global access provisions. “We do that even for early stage research, blue sky research, as we realize you cannot retrofit it,” she said. Through this policy, the foundation is trying to prevent situations in which an antigen is made accessibly, but the supporting adjuvant is too high priced to become affordable. Stuart when asked for the big health problems the foundation saw coming pointed to HIV. “It might be the biggest time bomb,” she said, with infections rates in sub-Saharan Africa of 50 percent by 2050 if nothing can be done. Industry representatives during day one of the summit touted the growth in new drugs, not the least in non-communicable diseases (NCDs) like cancer and cardiovascular diseases. Representatives of Pfizer, Sanofi and Merck pointed to their activities in cooperative efforts in research and distribution of new drugs. At the same time, they underlined the need for traditional incentives for their research as well. 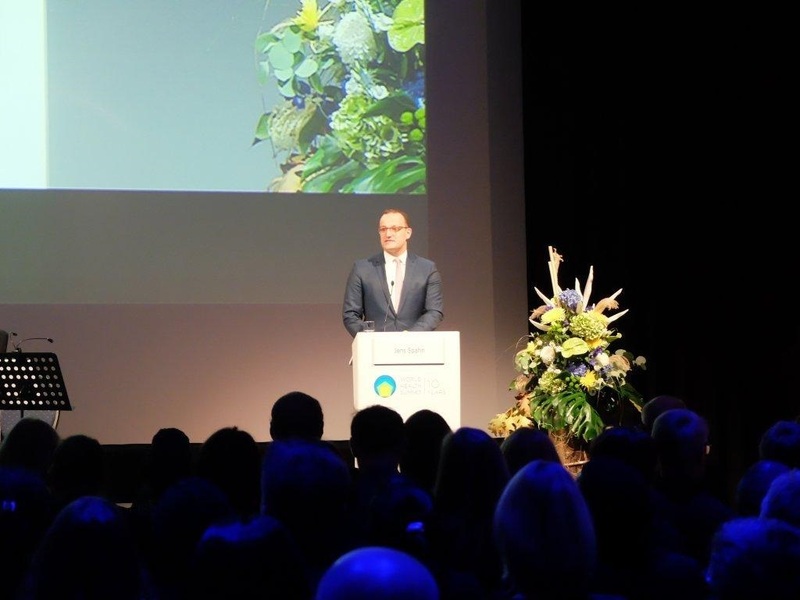 “Pharmaceutical innovations depend on the right incentive as medical research is a long, complicated and costly operation,” said Stefan Oschmann, CEO of Merck and president of the European Federation of Pharmaceutical Industries and Associations (EFPIA). Considering risks and long-term investment, “incentives in the form of intellectual property are necessary,” he said. Oschmann pointed to the high-risk low-revenue expectation paradox in developing new antimicrobial research. The pharmaceutical companies at the same time are prepared to partner to work on global availability of new drugs, he said. Merck, according to Oschmann, just signed the first contract on pricing based on the therapeutic benefit for patients. Thomas Cueni, director of the International Federation of Pharmaceutical Manufacturers and Associations (IFPMA), in a press release acknowledged that industry needs “to do more and do better to bring the fruits of its innovations to all, regardless of economic circumstances.” In a dedicated session on antimicrobial resistance, Cueni nevertheless warned that pharma companies are leaving the important antimicrobial research field, due to a lack of incentives. While an additional 500 million euro was announced to be spent by the German government on AMR under the newly set up Global AMR R&D hub, this is a drop in the sea, he said. Pharma had told him that unless they can get incentives, they are likely to reduce the investment. And intellectual property is a good incentive, he said. "World Health Summit Berlin: New Global Action Plan; Gates And Merkel To Open Global Challenges" by Intellectual Property Watch is licensed under a Creative Commons Attribution-NonCommercial-ShareAlike 4.0 International License.